At first pan on the stove. Now pour all the liquid milk. To be with cardamom, cinnamon and a little salt. Stir and simmer for 5 minutes before pouring the milk powder to the mix would hold. Now simmer for 10 minutes to narrate. Palau rice should be. Frequently narrate 10 minutes, keep in mind that the vessel does not take down. Condensed milk should be given. After the bloom will be 3-4 times thicker. With chopped nuts and raisins and stir to give a little bit of all types. Although it will take it off the stove and the smell was thick. 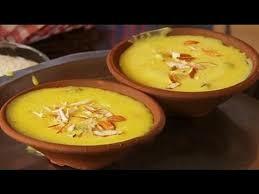 Finally serve this dish any decorated bowl and pour over the chopped nuts the firni amusing. Its so so yummy and healthy recipe.